I have two Halloween inkjet projects over at 1000 Words today. The first are Oscar and Stewie masks. Everyone in the office agrees they are eerie looking. 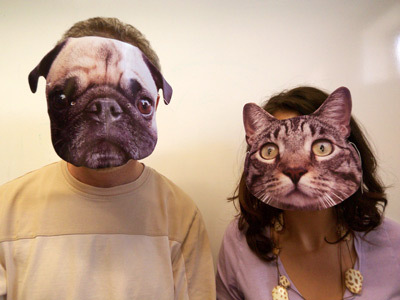 If you aren't sure what to be for Halloween you could go as a pug or a kitty. 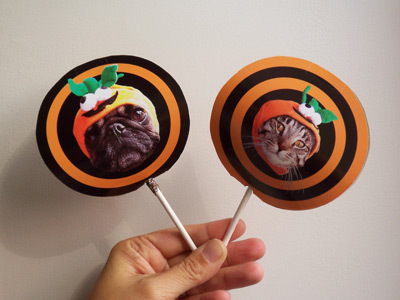 There are also downloadable templates for Halloween Oscar and Stewie lollipop covers. Kinda like my lollipop cozies but faster and easier to put together. Oscar and Stewie are demanding compensation for the use of their likeness. Greedy little critters. To download the pdf templates and see instructions on how to make the masks and lollipop covers check out 1000 Words. You are very creative! I think you are Rochester's Martha Stewart! By the way, I read your apple-picking post and I am just wondering if you can recommend a local apple farm where we can go to. The honeycrisp apples pictured in your entry looked so yummy I had to get some from Wegman's. I am a PinkLady fan but they are now out of season. Thanks! lette - oh thank you! As for the HoneyCrisp... we pick ours at Whittier Farms... I think they are out of season now though... I just ate my last one yesterday and I am going through withdrawl already. you kill me - These are so clever. These are clever ideas for the mask. Other items can also be printed depending on the design.